The avalanche danger is expected to rise to CONSIDERABLE in the Alpine by this afternoon as new snow along with wind is forecast. Wind slab avalanches up to foot or more should be easy to trigger on slopes that receive over 6-8 inches of new snow and are being loaded by winds. There is a MODERATE avalanche danger in terrain that does not see wind loading. In these sheltered zones, including near and below treeline, watch for shallow soft slabs in the new snow as well as sluffs on steeper slopes. Additionally, there is still a chance someone could trigger a large deep slab avalanche in shallow snowpack zones. If the snowfall forecast does not verify, the danger will remain MODERATE for shallow fresh wind slabs along ridgelines and MODERATE for triggering a deep slab avalanche. Many areas around Southcentral, Alaska including the Southern Kenai Mountains, Seward, Snug Harbor and Lost Lake, Anchorage Front Range, Hatcher Pass continue to have an unstable snowpack. Human triggered large avalanches, breaking near the ground, are possible. Please see links above for recent activity. Careful snowpack evaluation and cautious route-finding is essential. 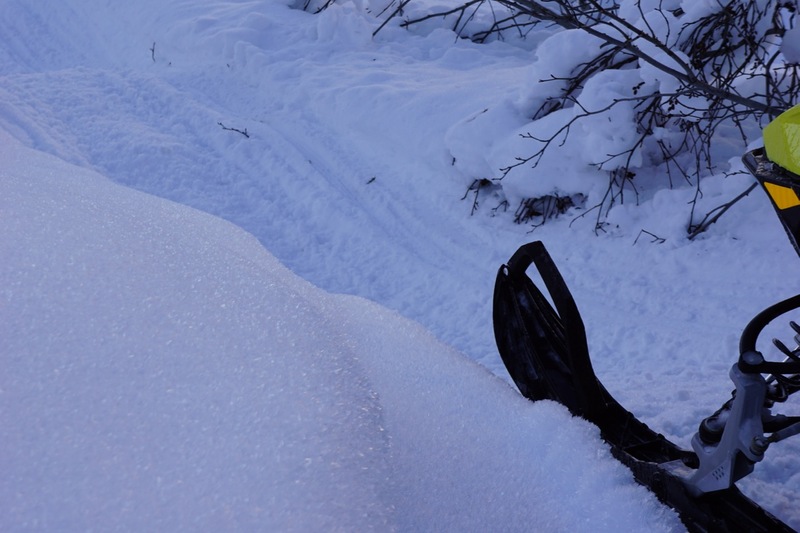 TOMORROW: CNFAIC and the Anchorage Snowmobile Club will be hosting a FREE Avalanche Rescue Workshop at Turnagain Pass, 11am -12:30pm in the Motorized parking lot. We will focus on practicing with your beacon, probe and shovel. This workshop is open to everyone and anyone, PLEASE JOIN US!! Click HERE for more details. SUNDAY: Alyeska Resort will be manning an avalanche beacon park from 12-4pm on the mountain. If you are skiing here on Sunday, stop by the area called 'Alpine', located downhill from 'Eagle Rock', for practice using your beacon and probe!! After a nearly two week dry spell, the mountains finally had a fresh dusting of snow in most areas yesterday. Yesterday was a teaser however with only 2-4" of very low density snow accumulating. Today, on the other hand, will hopefully be enough of a re-fresh to cover the plethora of old tracks littering the mountainsides. From this morning through tonight the National Weather service is calling for 5-9" of low density snow. They also have a Winter Weather Advisory is in effect. That all said, if the snowfall forecast verifies, along with the increase in wind; ridgetop winds due to pick up to 15-20mph from the North and West. We are sure to see several shallow wind slabs, soft slabs and loose snow avalanches. The new snow from yesterday and today is falling on a very weak surface of both near surface facets and surface hoar. It will not take much wind and new snow to create very touchy wind slabs. Due to the small amounts of new snow, these slab should fairly shallow - up to a foot thick, but prevalent. How much new snow has fallen? Surface conditions before the new snow: Surface hoar - this is now buried by 3-4" of new snow from yesterday, with more today. Unfortunately, we continue to find weak snow near the ground in the region (faceted snow and depth hoar). This is in a variety of layers all found in the bottom 2 feet of the snowpack. Areas with a thicker pack, such as the core slopes around Turnagain Pass, the weak snow is much stronger. But, just 5 miles down the road the pack is shallower and the weak snow is impressively weaker (as can be seen in the video below). After almost two weeks of quiet weather, these weak layers have become harder and harder to trigger as the pack has mostly adjusted. However, though the probability of triggering a deep slab avalanche is low, the consequences are high - as we have been saying for a while now. Keep that in mind along with sticking with safe travel practices. The new snow we are getting out of the system over us now is not adding much load (only around .5 to maybe 1" of water equivalent). However, next week's warm stormy weather could be enough to re-active these old layers creating large dangerous avalanches. We will see. Light snowfall covered the area yesterday adding 2-4" of very low density snow. Skies were mostly overcast with a few 'sucker holes' of blue sky in the afternoon. Ridgetop winds were breeze from a North and Westerly direction (5-10mph). Temperatures were in the 15-20F range in parking lots (relatively warm) and cooling down on the ridgelines to the 10-15F range. Today, we should see light snowfall kick up again, with another 5-9" of low density snow accumulating by tonight - possibly more in favored areas. Ridgetop winds are expected to bump up to the 15-20mph range from the North and West. Gap winds along Turnagain Arm at sea level should be strong. Temperatures are decreasing as this cold Northerly flow pushes through - single digit temperatures are seen in valley bottoms to ridgelines with sea level zones in the mid-teensF. Significant pattern changes begin this weekend as a more active southerly storm track pushes into the western Gulf. ..... The potential for some areas to receive significant snow fall followed by warming temperatures and abundant rain has the potential to make for a rather messy weather pattern.